Since the beginning of our relationship with our sister parish in Latiboliere, we have looked for ways to improve the health of the community by helping to meet their basic medical needs. It's hard to imagine walking several hours in hopes of finding ibuprofen or delivering a baby in your thatched home without any outside assistance. But these are just two examples of the many struggles faced by the members of our sister parish. 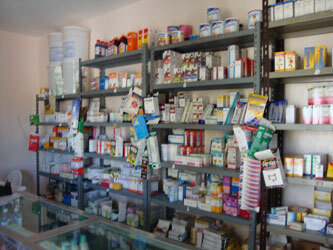 Thanks to you, each chapel (village) now has its own medical supplies! With your donations, we send money three times a year so that medical supplies can be purchased locally. We have sent medicine, bandages and other needed items with any visiting team and on our sea containers. More recently, we have established a relationship with a doctor who visits the village monthly. We pay his salary and that of nurse that tends to TB and AIDS patients. For many years, medical teams set up a temporary clinic and treated ill members of Latiboliere and surrounding villages. Spend just a day in the village of Latiboliere and you will be blessed with an appreciation for the quality of medical care available to residents in the United States. Being examined by a medical doctor is a luxury while toughing it out and hoping for the best is a reality. St. Mary Parish has made a difference but the need is still great; the services of eye care specialist and dentists are also desperately needed. Due to the length of time between visits and the arrival of sea containers, financial support is essential. Financial contributions and medical donations are always welcome. Donations should be approved by the Human Concerns coordinator or the Haiti Chairpersons before they are brought. Only certain things can be sent. All donated medicines must have a remaining shelf life of one year or more.